There’s only a week until Halloween and we have a lot to do, people. There are copious amounts of food-coloring, meat-sculpturing, vegetable-carving and other compound verbs that you never thought would be part of your late October repertoire. I’m always on the look out for a good white chili recipe, but I haven’t found one that takes all of the elements I like into one bowl. It’s a true slow-cooker recipe–not one of those fake ones that makes you prepare 9/10 of the ingredients on the stovetop before putting into the crock pot. I hate those. Why bother unless you really love doing dishes. Because this is made with ground turkey rather than beef, I think it’s well-suited to be put in the crock-pot raw. The only explanations I can find for browning first is for depth of flavor and to drain off the fat. With lean turkey, there isn’t much fat to drain off, so have at it. It will be cooked thoroughly after 8 hours. Also, this uses dried beans rather than canned which allows the bean to hold up and still have a nice texture. 1.) Put the ground turkey on the bottom of a heating slowly and break up slightly. Add next 11 ingredients and gently combine. 2.) Cook covered (duh) for either 8 hours on low or 6 hours on high. If it gets dry at any point, don’t be afraid to add more broth, beer or water. 3.) With 30 minutes left to go in the cooking time, add the heavy cream and continue cooking. 4.) 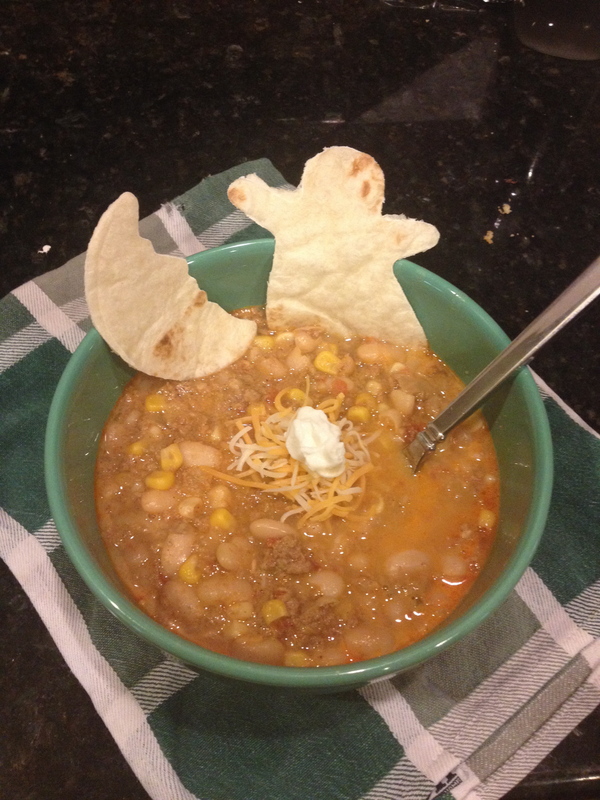 Serve with your favorite chili toppings, but be aware of hitchhiking ghosts.